Great indeed! What a big beauty of a water snail. 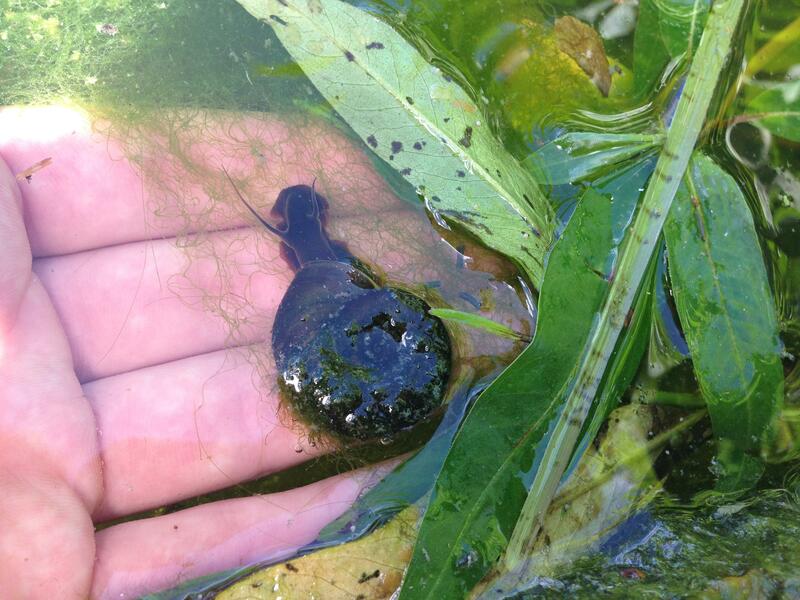 Like me, you may well have come across smaller Ramshorns Snails in freshwater sites. But this species, the mighty Great Ramshorn Snail (Planorbaruis corneus) is really something to write home about! The flattened coiled shell that resembles the characteristic horns of male sheep can reach 3 cm in diameter. This individual is living up to that sizable reputation. This species isn’t particularly uncommon, but it does struggle to colonize new water bodies, so tends to be local to certain sites. Hence count yourself as lucky if you see one. Ramshorn snails have special adaptations for living in small still water bodies, which often have low dissolved oxygen levels. Firstly they aren’t gill breathing snails (this strategy relies on high levels of dissolved oxygen in constantly moving water). Instead they have a lung within their shell, which means they can take in air from above the surface of the water. Like other types of water snails with lungs, they can sometimes be seen hanging upside down on the surface tension of the water breathing air from outside of the water. However, unlike most other types of water snail, their body fluid contains the protein haemoglobin; the same substance which occurs in our blood and is responsible for absorbing oxygen and transporting it around the body. Haemoglobin is very unusual in molluscs, and means these snails make the most of utilising the oxygen they breath. It’s the red colouration of haemologlobin which gives our blood it’s pigment and gives these snails an orangey red tint to their shell and foot. All in all, a pretty great snail! Cormorant; a bit wet or a well evolved fisherman?